A well-known comet is making its closest approach to Earth in many years and promises a good show. Comet Wirtanen is now climbing up the late autumn and winter sky for northern hemisphere viewers, and is already a fine binocular comet. By mid-December it might be bright enough to be visible to the naked eye, but only from a dark rural site. Discovered in 1948 by Carl Wirtanen at the Lick Observatory, his namesake comet orbits the Sun every 5.4 years. So unlike other recent bright comets that have visited us for the first time, Comet Wirtanen (aka 46P) is well known. It is one of many “Jupiter-family” comets whose orbits have been shaped by the gravity of Jupiter and orbit the Sun about every 6 years. However, despite this, we’re expecting – indeed already enjoying – a good show at this return. Due to the quirk of orbital clockwork, on this return the comet reaches its closest point to the Sun just before it is also closest to Earth. That puts the comet “just” 11,680,000 kilometres from us at its closest approach to Earth on December 16, four days after perihelion, the point when the comet is closest to the Sun. 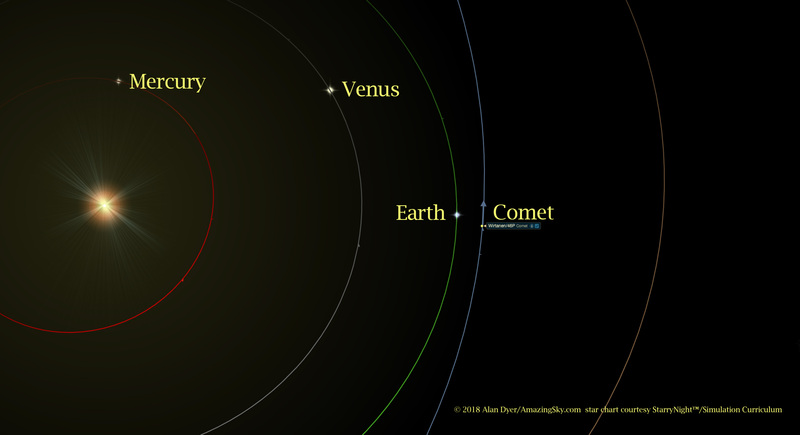 The relative position of the Sun, Earth and Comet Wirtanen on December 16, 2018. Comet Wirtanen will be relatively bright simply by virtue of its proximity. Comet Wirtanen is glowing at magnitude 5 to 6, technically making it visible to the naked eye. However, because it is large and diffuse, in practice you need binoculars to see it – now. But as it approaches Earth and the Sun, Wirtanen will brighten, perhaps to magnitude 3 (the brightest stars are magnitude 0 to 1), making it easier to see with the unaided eye from a dark site. The one catch is that as it heads toward its brightest in mid-December the waxing Moon also begins to enter the sky and wash out the comet with moonlight. 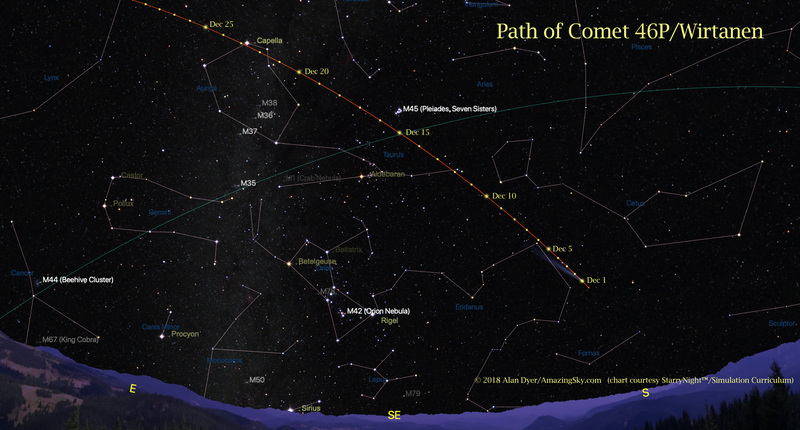 The path of Comet Wirtanen across the sky in December 2018. The yellow dots mark the position of the comet at nightly intervals for late evening (10 p.m.) for North America. While comet will be in the sky most of the night, it will be highest in late evening about 10 p.m. local time when the sky will look as depicted, with the comet high in the south to southeast. Click or tap to download a full-sized version. The first two weeks of December will be prime time for Wirtanen, with a particularly good opportunity coming on the evenings of December 15 and 16 when it shines below the Pleiades star cluster. The gibbous Moon will set about 1 to 2 a.m. with the comet still high enough for a dark sky view and photos. Those will be great nights to shoot the comet and the cluster with a telephoto lens, provided the camera is on a tracker for untrailed exposures of 1 to 4 minutes. A 135mm to 300mm lens will frame the pair well. Comet Wirtanen as a green glow at upper right here in Eridanus. and well to the west of Orion, rising here at left, on the evening of December 6, 2018. I shot this with a wide-angle 35mm lens in a blend of tracked and untracked 1-minute exposures. 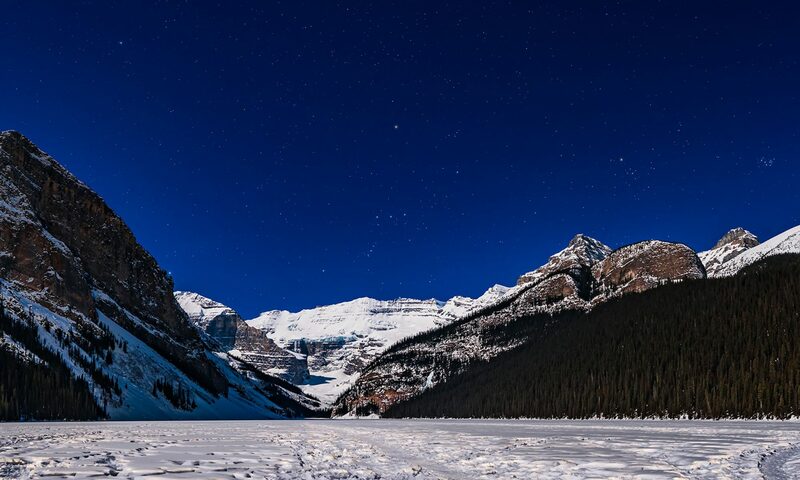 After that, through late December, the bright Moon will interfere with the view. For example, a close approach of the comet near the star Capella on December 23 happens with the nearly Full Moon not far away. Comet Wirtanen in a close-up through a telescope on December 6, 2018 in a stack of short and long exposures. I took the above close-up photo of Comet Wirtanen on December 6. It is a long-exposure telescopic view, but the comet is easy to see with binoculars. It appears visually and photographically as a diffuse fuzzball, with the camera recording a vivid cyan colour from glowing cyanogen and diatomic carbon molecules. You won’t see that colour with your eyes, even in a telescope. 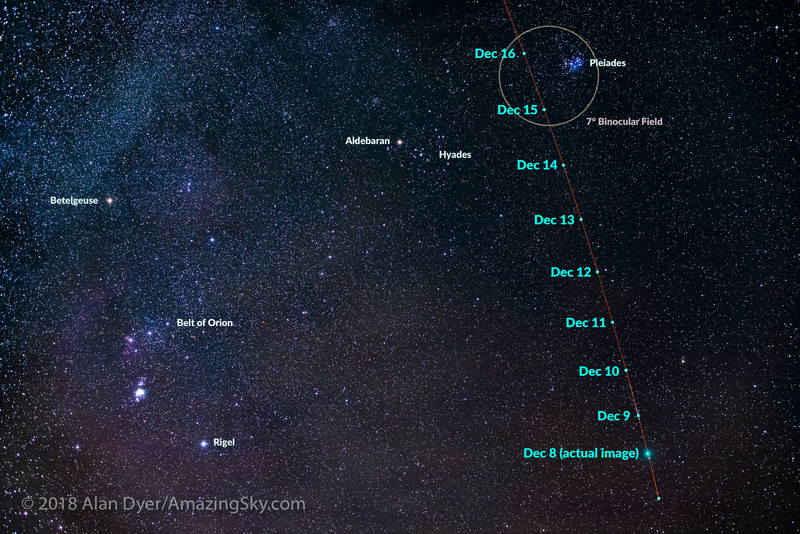 The path of Comet Wirtanen Dec 8 to 16 superimposed on an actual sky image with the comet taken December 8. The circle indicates the field of view of typical binoculars. On Dec 15 and 16 the comet will be in the same binocular field as the Pleiades star cluster. The positions are for about 10 pm Mountain Standard Time for each of those dates. Even at the comet’s best in mid-December any tail might be hard to see and even photograph (it appears faintly above) as it will be both faint and pointed directly away from us because, as comet tails do, it will also be pointed away from the Sun. Look for a large glow which will be grey to the eye but green to the camera. Clear skies and happy comet hunting!